Habits are a practice – like a meditation practice. And like a meditation practice, it’s damn near impossible to be perfect all of the time. But when we stray in one moment, we can always pull ourselves back in the next and start over. And YAY to that! Habits and goals are easier to maintain when we make it as easy as possible to do so. This means breaking goals down into smaller, more manageable chunks, for instance, and making habits more appealing to follow, such as letting yourself read or listen to an engrossing book only when you go to the gym. The implementation of habits and goals is often not as glamorous as we expect it to be. I fall prey to this fallacy all of the time – especially in regards to goals that I set with the dawn of a new year, when I’m super hyped. The beautiful journey of carrying out our dreams is often, paradoxically, a grind. I love the way I feel after I go to the gym, but do I ever want to actually go there? Rarely, rarely, rarely! Even after all of these years of maintaining a consistent workout habit, my brain protests in resistance at the thought of going, making excuses: “I am still sore from my last workout”; “I’m tired after a long day at my day job”; “I forgot to pack a hair tie in my gym bag” (really?). I’ve honed the ability to push away resistant thoughts and do the damn thing anyway, because it’s for my greater good, and I’ll be happy when it’s done. As long as I’m not pushing myself in an unhealthy way, going past my energetic breaking point of doing too much (something I’m mindful of with my hyper-achiever personality), ignoring the resistance works to my benefit. When it comes to the habit of eating healthfully, I will never be perfect, but I am pretty damn good. And I have to give a lot of the credit to all of the incredibly delectable healthy meals this world – with all of its abundant diversity in produce and ancient grains and lean proteins and other nutritious yet flavorful goodies – allows us to make. The longer I’ve had an interest in cooking and healthy eating, the more I’ve realized that I don’t have to sacrifice taste for healthfulness; in fact, the less and less I eat the processed food I used to think tasted so great, the more gross I find most of it to be when I do eat it. It often tastes fake, overdone: too sweet, too salty. When it comes to flavor, nature knows what it’s doing! And today’s recipe has nature’s beautiful vibrant flavor in spades! I’m so pleased with the way this Arugula Quinoa Salad with Baked Pears and Meyer Lemon Vinaigrette turned out. It’s my current obsession; it’s so darn good! I don’t generally buy arugula, and I’ve never previously made a salad at home that incorporated quinoa. But I had a great arugula quinoa salad out at a restaurant this fall, and it stayed on my mind. I am LOVING the peppery arugula with the sweet-tart Meyer lemon vinaigrette, the crunchy walnuts, and the savory feta cheese. And the pears! The pears are a revelation! OMG, how have I not had baked pears on a salad before? Their unadulterated sweetness pairs so wonderfully with the other flavors of this salad. I seriously-seriously could eat this salad at every meal right now – it’s that good! I was concerned when baking the pears, which were quite firm still, that they would not come out with much flavor, but they did. In fact, I realized that I preferred using firm pears to the ripe ones I generally use for this purpose. Ripe pears run the risk of turning mushy when they are baked. They will still taste good, but you may experience difficulty keeping them intact; they won’t look as pretty on your salad. A firm pear requires a longer roasting time (mine took 35 minutes for this recipe), but they will maintain form even when softened enough by cooking to pierce easily with a fork. If you’ve never heard of Meyer lemons and are wondering what the heck they are: they are lemons that are smaller and have a brighter yellow rind and inside fruit than the conventional lemon we are all used to do. They also have a sweeter and more vibrant flavor. And they are currently in season! But if you can’t find them in your grocery store, you can definitely substitute regular lemons for them. Regarding the vinaigrette: this dressing recipe makes quite a bit of dressing, more than you will need. I like to make larger portions of dressing because I like being able to liberally pour it onto my salad and having extra that I can use later. This vinaigrette will store in a sealed container in the fridge for up to a week. It may solidify there, but you can easily nuke it in the microwave for 20-30 seconds to bring it back to room temperature. Alright, it’s time: on to the recipe! Preheat oven to 400 degrees. Remove the skin from the pears using a vegetable peeler. Chop the stem off of each pear, then cut each in half lengthwise and cut out the inner stem and core. Cut each half lengthwise into smaller slices, then add to a baking dish and drizzle with the coconut oil. Let bake for 10 minutes, then stir and let bake for an additional 5 to 10 minutes, depending on the ripeness of the pears being used. Check again. Very ripe pears should only need 15 minutes, while firm pears can take at least 35 minutes. Keep checking and stirring periodically. Once you know the pears are ready (when you can easily pierce them with a fork), remove them from the oven and let cool. 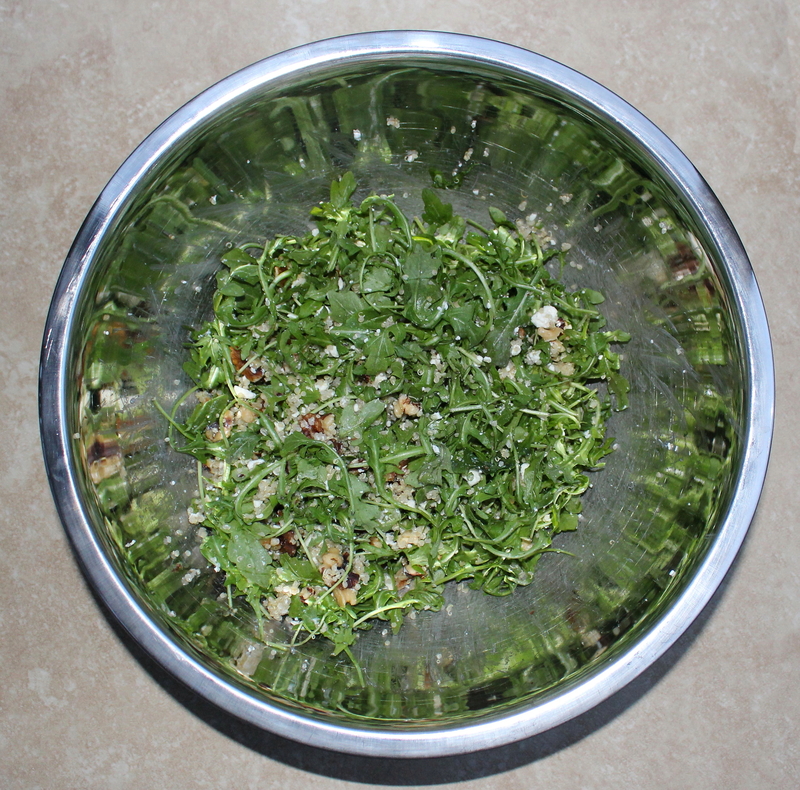 In a large mixing bowl, toss the arugula, quinoa, walnuts, and feta cheese. To a Mason jar or similar container with a lid, add the vinaigrette ingredients and shake vigorously until well combined. 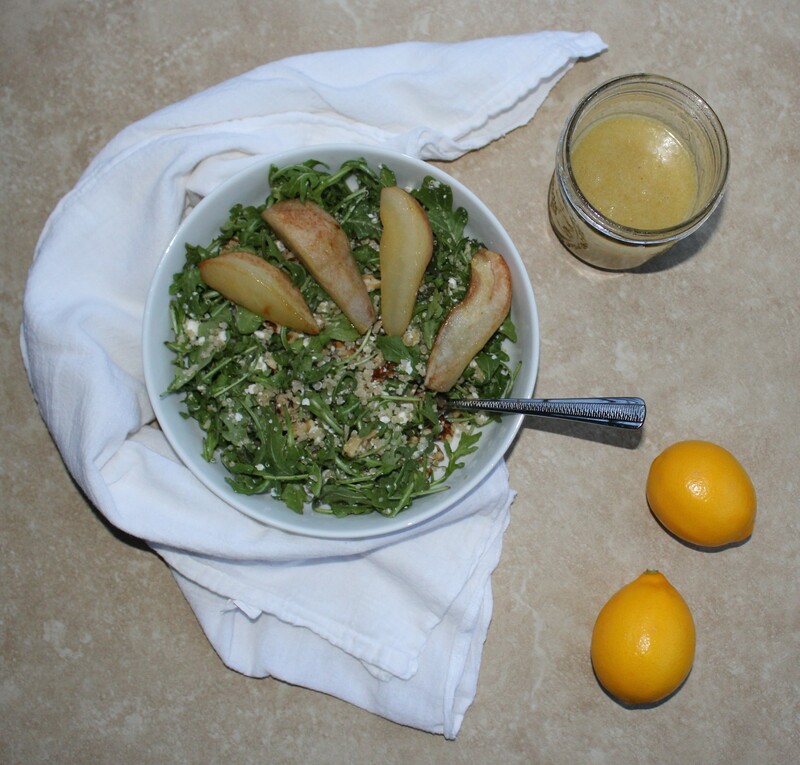 When ready to serve, top portions of the salad with the baked pear slices and drizzle with the vinaigrette. Then enjoy! Makes two to three entrée-sized portions.